I knew nothing about the saving side of the equation, but investing extra money had me curious. I opened my first Ameritrade investing account when I was a senior in college. I invested the money I received as a graduation gift into this account, in some stocks that my parents and grandparents recommended (Coca-Cola, MedImmune, and some others I can’t remember). I picked up the occasional book on investing, such as The Only Investment Guide You’ll Ever Need, and The Little Book that Beat the Market. I left my money to grow and forgot about it. It sat and grew for a couple of years, until 2006, when Mr. ThreeYear and I were ready to buy a house. Then we cashed out what was now $12,000 US and used it as a down payment for our first house. When we lived in Atlanta, we went to several real estate seminars. Because we owned an apartment in Chile that we’d bought right after we got married, we always assumed we’d use real estate to build wealth. In fact, after we bought our first house, our real estate agent took us out to look at several rental properties. But we never bought. This was the same time frame as when we were paying off our debt, and our desire to pay off the debt made us feel intensely conservative. We never felt like we had a big enough cash cushion to buy a rental property. Thank goodness! Turns out we were looking for houses at the height of the real estate bubble, and in 2010, just two years later, real estate prices in Atlanta would plummet. In fact, when we sold our house and moved to New Hampshire, we sold our house at a loss, in the worst real estate market in 100 years. 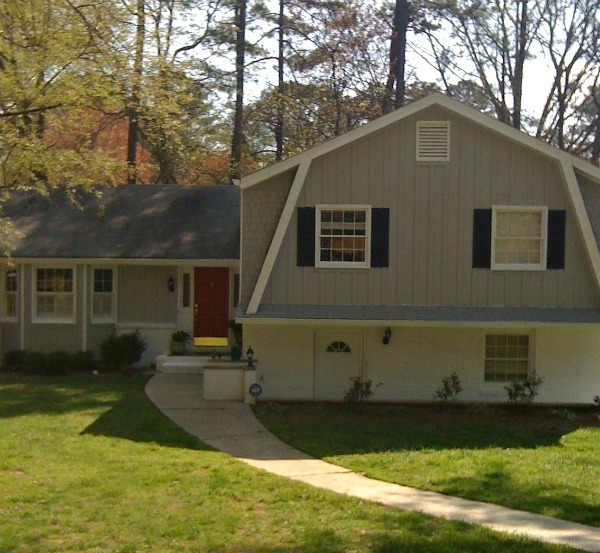 Our first home in Atlanta. But during this time, we kept investing in the stock market. We invested through Mr. ThreeYear’s 401k. We invested through our IRAs. We invested through Mr. ThreeYear’s Employee Stock Purchase Program, where twice a year he could buy discounted stock from the corporation he worked for. We knew we needed to save for retirement, and we’d heard this was how you did it, so we kept socking money away. 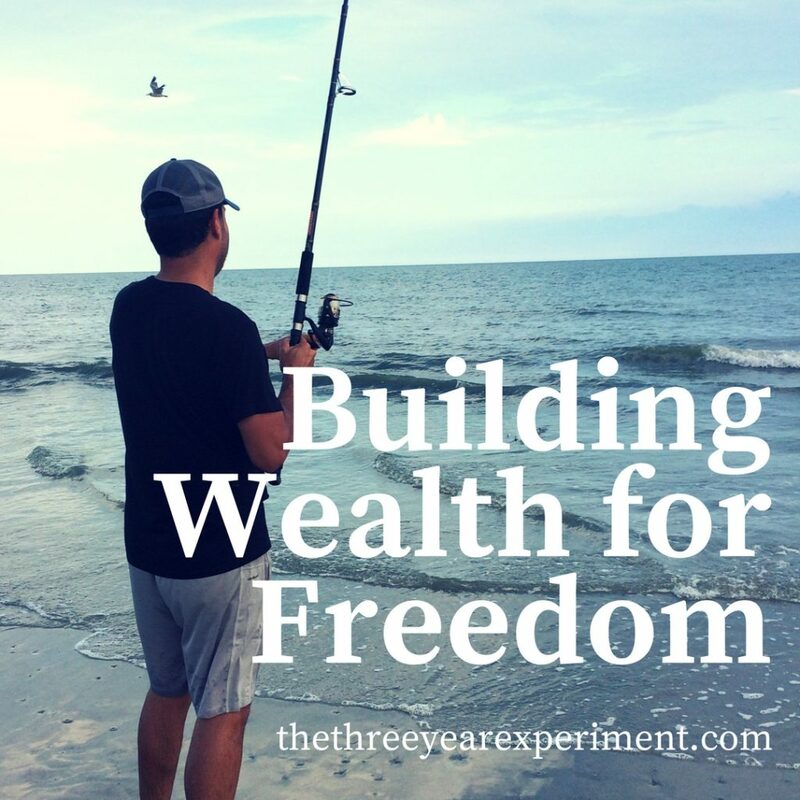 Mr. ThreeYear and I didn’t really understand the concept of actively building wealth until 2011, when we’d paid off our debt and started to track our net worth. It was at that point that I’d found a (now-defunct) website where anonymous people posted their net worth updates each month. It was fascinating. You could filter by state, and I would look and see who the richest individuals in New Hampshire were. We started to aspire to grow our net worth to their levels. Then I found JL Collins’s stock series. At this point, we were living in New Hampshire, in a rental. We only had one income–Mr. ThreeYear’s, because I was staying at home with the boys. We were saving aggressively for a house down-payment, but I also knew that we needed to invest more if we wanted to increase our net worth. What to do? Save a bunch of cash for a down payment, or max out our 401k? Despite the fact that we were debt-free at this point, except for our apartment in Chile, we hadn’t figured out how to keep our spending down to levels that would allow us to save almost half of our incomes. So we compromised. We saved 6% of Mr. ThreeYear’s income in his 401k, enough for the match, and shoveled the rest into a house down payment fund. In two years, we had enough for a downpayment and we bought our house. Then, we got more serious about investing. We slowly, over a period of three years, increased Mr. ThreeYear’s 401k contributions to the maximum. I got a part-time job in 2014, and put a good chunk of my salary into a 401k. Then, we started to figure out how we could save more, so we could open some taxable investment accounts (where we’d have more flexibility with our money). 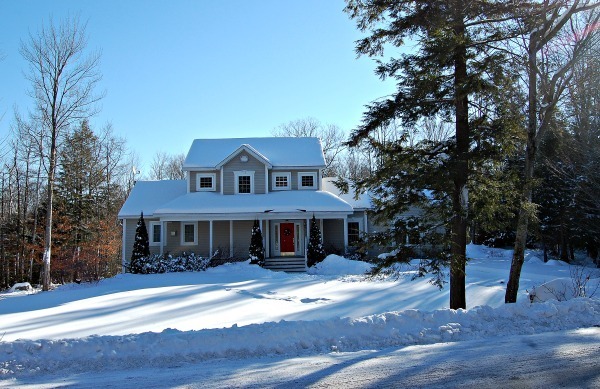 Our new Hampshire short-sale house. We knew the answer lay in paying off the debt we’d picked up. After we bought our house, we were strapped for cash, so we bought two cars with low-interest loans. And we were still paying off the apartment in Chile. So, we made a goal to pay off those debts, and once that was done, we would have a lot of extra money to put into a taxable account. These funds have very low expense ratios. They mimic the behavior of the total US stock and/or bond market as well as the international market. This post is not a how-to-invest post, so I won’t go into specific allocations and our reasoning behind such allocations, but I did want to mention what the majority of our investment dollars are invested in. Finally, last year, at the end of 2017, we finished paying off our debts, and we now have a sizable amount of money we’re able to save each month. Meanwhile, our stock investments have kept growing. Our real estate investment has grown, and we’ve doubled our net worth several times since 2010. I realized, through the years, that just as the experts say, those small amounts we invested early on have grown significantly over time. In hindsight, we should never have cashed out my Ameritrade account, and let it grow. But, hindsight is always 20/20 and we’ve learned from our mistakes. 2001: I started an Ameritrade account with $3,000. 2004: We bought an apartment in Chile (15 year mortgage). 2005: I started an IRA with T. Rowe Price, contributed $100/month. 2005: Mr. ThreeYear started contributing to his 401k, 8%. 2006: Mr. ThreeYear bought stock through his ESPP. 2007: We began saving for the boys’ college funds. 2009: We finished paying off $38,000 in debt. 2010: We started saving up for a down payment on a new house. 2010: Mr. ThreeYear switched jobs and began receiving company stock each year as part of his compensation. 2011: I started tracking our net worth. 2012: We bought a short-sale house with a 15-year mortgage and 20% down. 2014: We finally began maxing out Mr. ThreeYear’s 401k. 2014: I got a job and started a 401k. 2014: Mr. ThreeYear’s company becomes 100% employee-owned and the amount of stock he receives each year increased. 2014: I moved all our non-401k investments over to Vanguard (see specific investments above). 2017: We paid off our cars and the apartment in Chile and started our taxable investment account. As you can see, it has been quite recently that we’ve started maxing out Mr. ThreeYear’s 401k and seriously seeing our savings snowball. Our early investing efforts, as meager as they felt at the time, have helped us a huge amount. Those small bits of money have grown and doubled several times over the last thirteen years. While we’ve never reached a 50% savings rate with our money, we’ve saved 25-45% of it through most of our marriage, except during the debt-payoff years. But it’s only been in the last few years that we’ve maxed out Mr. ThreeYear’s 401k! My point is, the small bits and pieces we managed to save early on, even in the midst of taking on debt and making other bad choices, have helped us in our wealth-building journey. It doesn’t matter how small the amounts that you’re saving–they add up! They also get you in the habit of thinking about investing as part of what you need to do with your money. I wish that our wealth-building had been more spectacular, had started earlier, or somehow looked more sparkly and fun. But the truth is, it’s been slow, boring, and often meager. But it works! It really does. We don’t share our total net worth numbers, but those meager bits and pieces have grown to quite a bit of moolah. The more we save, the freer we feel. If you, like us, feel that your contributions are small and ordinary, take heart! With the magic elixir of time, these small and ordinary contributions, faithfully made over many years, grow into a substantial nest egg. And give you choices! And freedom! What’s your best wealth-building tip, or your biggest question about how to increase your net worth? Also: I’m being featured on MSO Life today! Check out my guest post!! Small steps to eventually big results. The snowball will continue to grow as you focus on it! Some good steps there Laurie, have to admit I did not start investing young at all. And really, my big wealth building tip is to earn more. That is without doubt what catapulted me along the road wealth wise. That is a very good tip, and one I don’t really go into in this post. But it’s super important, and I’m planning a follow-up post on how we grew our incomes. Just goes to show the turtle wins the race. I do hear that investing in those companies who have been around a while and have a proven track record are the best companies to invest in. You have done very well to get to where you are. Thanks for the kind words, Mohammed. Nowadays, we invest in Vanguard index funds, which I didn’t mention in the article. I’ll fix that. 🙂 Even Warren Buffet recommends them, as sometimes even blue chip stocks let you down. But I think the act of investing, and leaving our money to grow over the years, is the single best thing we’ve done to build our net worth. I didn’t know about the rental story! Glad you guys didn’t make the jump for a rental either. They’re more work than stocks and that’s why I want to hang it up. The world is too big to tie yourself down with more than one house in my opinion! You guys will get to 50% rate someday, it’ll build to that eventually. Yep, I think over the years I’ve figured that out. For us, it’s not worth the few extra percentage points of gain for the mountain of work. And we’re not handy, so there’s that. I’m hoping this year we’ll surpass 50%. Fingers crossed!! !